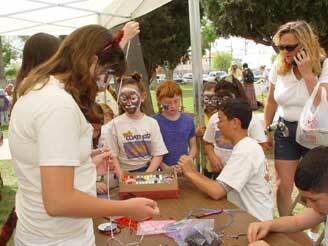 The Coati Kid's Club at the City of Tucson festivities and parade. 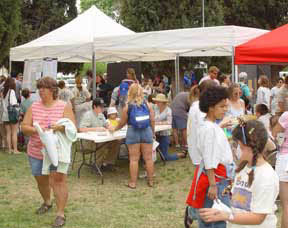 Tucson's Earth Day events have becomea regular part of the Desert Musuem's Coati Kids Club calendar. Every year we sponsor the city-wide Earth Day Poetry Contest in which students from local schools are invited to compete. Winners of the contest read their poems at the city event. 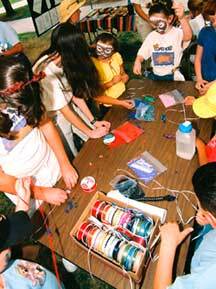 We also have a booth featuring fun crafts and information. 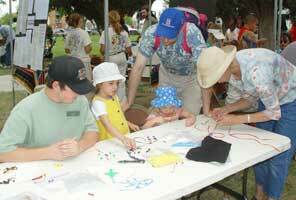 The Museum's Junior Docents taught people to make beaded animals at our booth this year. 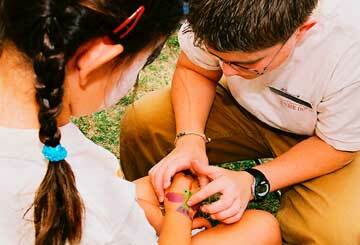 They also offered face painting at our booth and painted faces of the Coati Kids who marched in the Earth Day Parade. 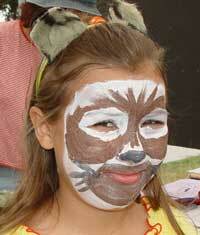 They created wonderful coati faces which the kids topped off with ears and tails to become a troop of marching coatis. A special addition to this year's parade was a fantastic float. 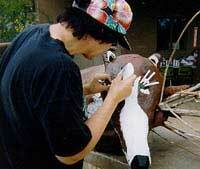 The Coati Club's founder, Deborah Blattstein, her daughter Ayelet, and other volunteers built "Carllie the Coati." 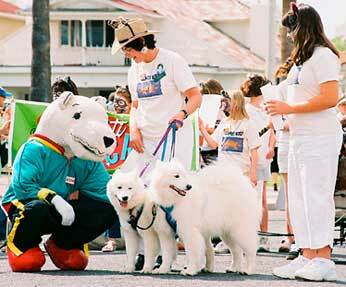 Deborah's Samoyed dogs Ilanit and Yoda pulled the float. They were a big hit with visitors to our booth, too. 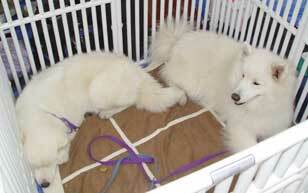 The dogs had their own shaded "play pen" at the booth. At noon the winners of the Poetry Contest read their poems aloud on the central stage and received certificates and ribbons. They were chosen from over 160 poems submitted this year! Click to read the first place winning poems. Who's the fuzziest of them all? 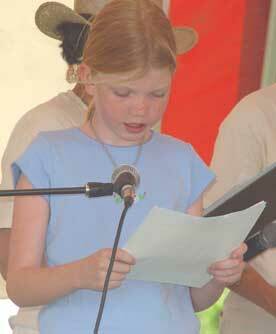 Overall winning poet Lauren reads her poem. Click here to see more winners reading their poems.